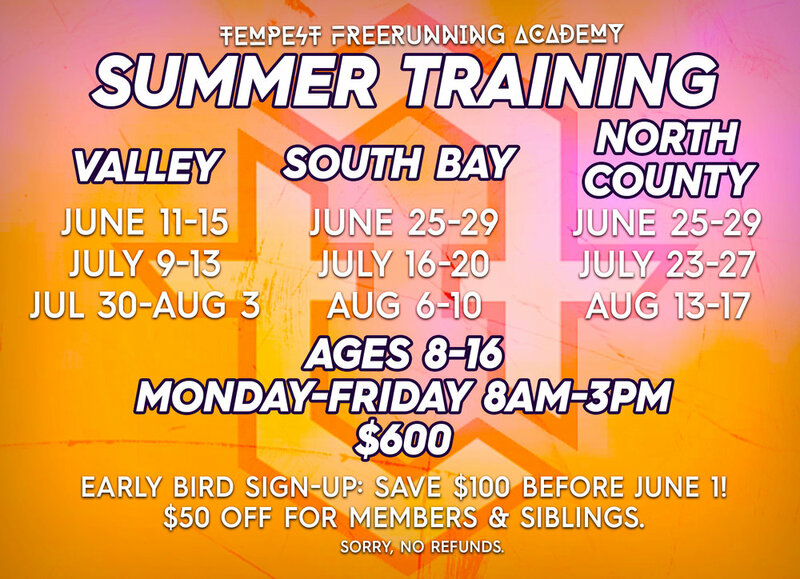 It's that time of year again... SUMMER TRAINING AT TEMPEST ACADEMY! We'll have some of the best freerunning coaches in the game spilling their brains and teaching you everything they know! Girls and boys of all freerunning abilities will benefit from our world renowned, championship-winning skills. Whether you want to be the next world champ or just work on your kong pre's and cat leaps, there's no better place to start than here! So what kind of cool stuff will I get to play on? If bouncing around a real life Super Mario world wasn’t enough, our facilities were designed and created not only by Team Tempest, but also the great Nate Wessel (Chief X-Games course designer/builder) to provide over 7,000 sq feet of indoor fun. Obstacles in our gyms are inspired by our favorite hot spots from around the world. Sign up before June 1st for $100 off. Members/Siblings get $50 off!